Our beloved Google Groups was hit with some forum spam the other day. A Google Groups thread in the Webmaster Help section reported it back on January 30th. 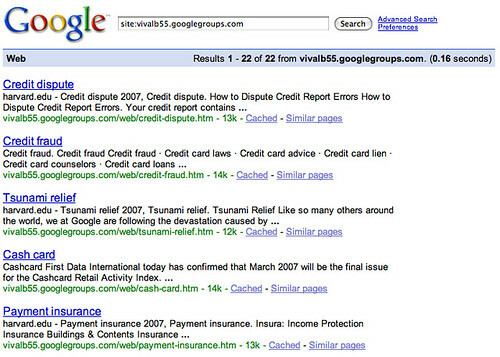 Duncan at TechCrunch reported it a day earlier with his Go To Google Groups. Get Tricked Into Downloading Malware. Do Not Pass Go. As you can see, users set up multiple accounts and then did tons of posts. Then some how they did a redirection from their post to their site. It still works if you use the cache link. For example, this cache link will redirect you to this site, which is on debt consolidation. The domain is registered at GoDaddy under a private registration, but the DNS information points to ULTRADNS.NET. Thanks for bringing this issue up. I've passed it on to the team. In general, if the group had normal postings, you could use the "Report this message" link (under "More Options") to report things like this. In cases like this where there are no postings to report (but where the group clearly abuses our terms of service), you can send an email to abuse @ googlegroups.com providing the information that you have. Previous story: Google AdSense Earnings Way Down in January 2008?